Skiing has always dictated my life. Personal decisions have never been made without first researching the mountains and counselling how good the tunes were going to be The first time I cam to Japan was on an English teaching program where I was given three choices as to my placement. There were rumours that you were lucky to get any of your choices. A friend from a small town in New Zealand chose Tokyo, only to be posted to the smallest fishing village in Japan. My choices were made based on the merit of the skiing and luckily found myself in the mountainous region of northern Honshu. But it wasn’t my first choice. That was actually Hokkaido. My interest in the northern island was piqued back at university and video nights with fellow members of the ski club, watching snowboarding videos of pro American snowboarders in Niseko. These guys were some of the first foreign professionals to Hokkaido to ride some of the mystical powder that the island is now famous for. Fast forward several years and at the time living in Tokyo. Tow northern hemisphere winters had come and gone and the only snow I had seen was a brief flurry. I was a fish out of water. I had a goal of starting a ski guiding business on the northern island, and persuaded my wife that a life living the dream was better then anything we had found in Tokyo. In October of 2003, bags were packed into a small van, ferry boarded, and after a night sailing over the Sea of Japan, we were driving to the Central Hokkaido town of Furano. At the time, there wasn’t a lot of information on the web about Central Hokkaido or Furano, at least not in English. It was better known as a summer destination and for the numerous lavender farms which are dotted around the valley. But the pieces of information regarding the mountains and skiing seemed compelling. The Daisetsuzan National Park and its volcanoes loom large over the landscape, 2,000 meter peaks with both alpine and tree skiing, lodges with thermal hot springs nestled within, and a deep, deep snowpack. It ticked all the boxes for what you would want from a ski trip in Japan, and a guiding business. My first season here was an exploratory one to assess the area’s potential for good skiing. On backcountry days at the southern end of the national park, I was joined by a fellow Australian whose job was to clear the roads into the hot spring lodges. A big undertaking, but not his particular task. He would sit in an idling vehicle with a heater on full blast at the bottom of the hill, book in one hand and a cell phone in the other, ready to warn the snow clearers of an approaching vehicle. Once the roads were cleared, he would set off after my ski track and we would spend the rest of the day riding the powder. And what powder it was. I remember sitting in one of the outdoor hot springs after a particularly good day skiing and being mesmerised by the falling snow. It almost looked as though there were feathers falling from the sky, like a giant pillow fight had taken place above us. The flakes seemed to float as if suspended in the air forever before making a soft descent. Asahidake is one of the magical places in the area where there is lift access to this amazing snow. I have had days there where our tracks would be covered on each run down, big deep twenty centimetre trenches gone after only 40 minutes. All but vanished, as if someone was playing tricks on us. Deep days are the days where the snow flies over your head, and those aren’t rare. One only needs to ski through the old growth spruce and see the giant blocks of snow resting on the branches to realise that this is a very high snowfall area. Hokkaido is covered in volcanoes. There are 13 active volcanoes on the island and two of them are in the Daisetsuzan National Park, one of those being Asahidake. When the skies do finally clear and you see this volcano, it is quite breathtaking. Active enough to let you know you are standing on something live, in both sight and smell. Smoke billows from multiple vents and fissures and noxious sulphurous gases plaster parts of the snowpack in shades of green and yellow. of course Niseko. There are days, especially mid-week where it feels you are one of only a handful riding the lifts. to skiing consistently good snow conditions, as long as you know which resort to go to depending on the storm directions. Five centimetres at one field could be over a foot at another. That is probably how the area acquired the name, ‘Hokkaido’s Powder Belt.’ It is an apt description. So it has been over ten years now and we are still here. In that time we have skied a lot of powder and had many ‘days of our lives’ in powder terms. Word has spread through the internet where there is now a lot more information in English now. In this age of global warming and diminishing snowfalls, it is good to know that there is an island on this planet where it still snows and snows. a mountain which means not only the delicious meals the lodge serves, but also a hot springs, an izakaya pub, and local restaurants. Nowhere else is offering a powder package like this one; it’s completely new. Tours will depart from January to March, almost every week. 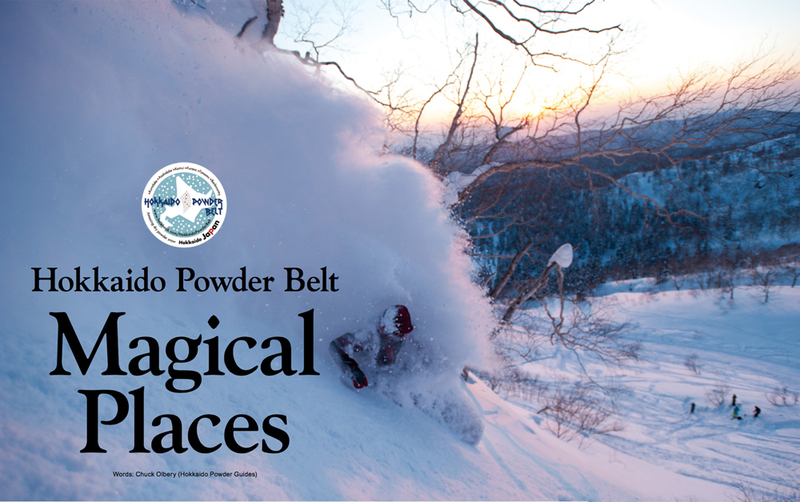 Go to the Hokkaido Powder Guide website for more information.